So, what do you need to consider when purchasing flat pack containers? We’ve covered everything in this buyers guide. What is a flat pack container? Flat pack containers, also known as modular site containers, consist of panels that slot together to create a sturdy storage solution. In recent times these containers have been more commonly used due to their durable, yet lightweight features that make transportation easy and keep contents safe and secure. In fact, many flat pack containers offer impressive safety features that can discourage and even prevent theft of important tools and equipment stored within. Who should consider a flat pack storage container? Construction contractors looking for quick, convenient and efficient storage will benefit from a flat pack storage container, particularly when there’s a need for storage but there’s limited space or restricted access. Flat pack containers are easily transported because of their lightweight features, and can be dismantled just as effortlessly as they are constructed. This means that if you need more space, or don’t need the container, you can easily pack it away to create more room and re-construct it when needed again. The speed at which these products can be assembled and disassembled is of particular use to contractors because it really means less time is spent on getting a storage area set up and more time is spent working on the task at hand. In fact, effective storage containers can save money in other ways too. According to the Federation of Master Builders (FMB), more than 51% of builders in the UK have been a victim of tool theft. With that in mind, it’s important to consider the security features of flat pack containers - many are constructed with extremely robust materials in order to combat this. Where to buy a flat pack container? If you’re looking for modular site containers it’s important to choose the right provider. As leading suppliers of secure storage solutions for tools, equipment and hazardous substances, Armorgard understand exactly what is needed - security, durability and quality. All Armorgard products, including our Forma-Stor flat pack containers, are exceptionally secure and enjoy the reputation of being indestructible and reliable within the industry. Further to that, strict quality control and ergonomic design make the product easy to use and allow optimum productivity. You won't find better products anywhere else. The Forma-Stor is a great example of all these features in action and if you require a flat pack container for your construction project, it is certainly one to consider. Simply get in touch with our experienced team to discuss your requirements. Forma-Stor is our quick and easy to assemble flat pack container for on-site storage. 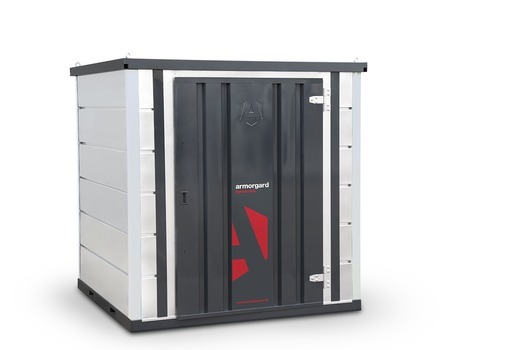 Armorgard’s aim is to increase security, safety and productivity in the construction industry, so this high-quality modular site container has been designed and manufactured with that in mind. So, what makes this container stand out amongst the rest? Constructing the Forma-Stor flat pack container couldn’t be easier. These walk-in units are constructed using galvanised panels that slot together simply. Not only does this mean that the container can be assembled in as little as 10 minutes, the final result is a sturdy, weatherproof store that comes in multiple size and format options. Take a look at how easy it is to assemble the Forma-Stor below. Forma-Stor features forklift pockets for easy transportation and lifting eyes for crane loading so you’ll have no trouble at all when it comes to moving in and out and around your site. Further to that, the entire container is designed to be lightweight, so moving panels around for assembly is easy - it can be assembled with just two people. With the theft of tools and equipment on the rise, security is a key factor when choosing flat pack containers. Forma-Stor containers come with 5-lever deadlocks and jemmy proof joins that ensure security at all times. This means peace of mind because you know your equipment will be safe on site. How to choose the right flat pack container? Each model varies in size meaning there is a model for every site, regardless of the space available. In fact, Forma-Stor flat pack containers are ideal to place in awkward corners or hard to reach spaces. Looking for durable, robust and reliable on-site storage? The Forma-Stor flat pack container is the ideal solution for all contractors working on site. Request a quote today by adding your chosen product to your enquiry basket.